Myanmar is a tourist friendly country in south east Asia. Another name for Myanmar is Burma, it’s capital is Yangon also known as Rangoon . Myanmar has many golden pagodas, that’s why known as ‘Golden Land’. Recently this country has become very famous for tourist to explore unique cultural and geographical diversities. People and very honest and kind. all kind of tourists can receive best hospitality in this land. there are many new hotels constructed in recent years, so travelers have choices of accommodations based on budget. Mysterious authentic Myanmar (Burma) tour start and end in Yangon, will explore Bagan which has many pagodas, known as garden of Pagodas. then we continue Inle. ‘Inle lake’ is another hub for Nature lovers with beautiful lake and mountains. We suggest to use local guides and drivers in each destination to get in-depth experience. best suggestions of accommodations are 3 stars, 4 stars and 5 stars if available in that location. For intercity transport we use flights, so internal flights we need to book in advance. our local car and drivers always available. we have local expert guide to welcome you in every location with your name card. Best season is winter time, but very busy so plan in advance to get best facilities. September to March is best to travel. Summer is hot, but still we get some travelers who want to travel when mysterious authentic Myanmar Burma tour is less busy. On arrival at Yangon airport, be met by your guide and transfer to hotel for check in. Depending on time of arrival sightseeing to be advised. Sightseeing highlights in Yangon to include: the beautiful Kandawgyi Lake, Botataung Pagoda, through which you can walk and see many ancient relics and artefacts; downtown Yangon where you can walk along Pansodan street with its many large colonial buildings, which are still in use. It is also interesting to see the side walk markets including those selling old books and magazines dated from the 1960’s up to the present day; the colossal reclining Buddha Chaukhtatkyi. Finally visit the awe-inspiring Shwedagon Pagoda which towers over all of Yangon. It is perhaps the most beautiful pagoda complex in all of Asia and is one sight that no visitor to Myanmar should miss, Overnight Yangon. After breakfast continue exploring Bagan. Tour highlights include: Dhammayazika Pagoda, Layhmyetna Temple, Tayokepyay Temple, Nandamanya Temple and Phayathonezou Temple. Visit Minnanthu Village and see the daily life of the villagers. . Visit a lacquer ware shop and observe the traditional art of making beautiful lacquer pieces. Later, transfer to the jetty to take a boat ride to Kyaukku U Min and then enjoy a sunset on the boat. Overnight Bagan. Breakfast at the hotel , then drive to airport and fly to Heho. On arrival drive to unique and magical Inle Lake, located about 900 meters above sea level and 22 km long by 11 km wide. It is home of the Inthar people, one of the minorities of the Shan race . Arrive Nyaung Shwe jetty and start our sightseeing by long tailed boat to Innpawkhone Village where you can see lotus and silk weaving industries. Next visit Nanpan to see the traditional boat making, cheroot (Burmese cigar) making factory. And then continue our visit to Phaungdaw U Pagoda and if we have time, take a short visit to Leshae Village where you can see the making of Buddha image from dried flower powder. Later visit the ‘jumping cats’ monastery and floating gardens. Overnight Inle Lake. 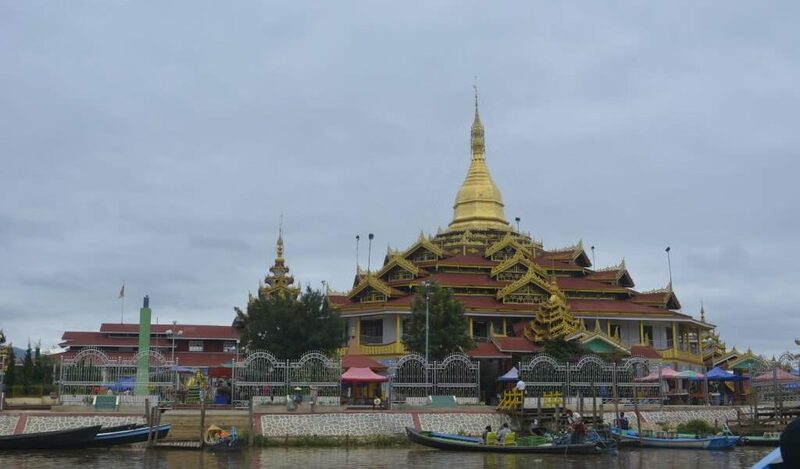 After breakfast at the hotel, continue our excursion by motor boat to Indein pagoda complex, in the south-western district of the lake. Travel along narrow canals before reaching Indein village where you’ll find the 13th century monastery and the very impressive ruins of hundreds of ancient pagodas, some hidden in the vegetation. The main stupa-area on the top of the hill offers breathtaking views over the surrounding mountains and down to the valley and the lake in the far distance. Return to your hotel and overnight Inle Lake. After breakfast at the hotel, drive to Heho airport for your flight back to Yangon. On arrival at Yangon Airport , transfer to the hotel and at leisure for the rest of the day. Overnight Yangon. After Breakfast at the hotel, transfer to Yangon International Airport for your International departure flight.